Unless this t-shirt was solely made to troll gun enthusiasts, I find the lack of research that went into its design is appalling. I love how the one handgun is just a mirror image of the other, and that there are bullets on the shirt… not cartridges. A nod to reloaders perhaps? Cool Glock make polymer Berettas now. And this is why i diss on Glock. Because a whopping 80% of their fanboys think any pistol is a glock. And 100% of all journalists thing all pistols are glocks. And now it’s on T-shirts. Is that a “Flintlock Glock” in the bottom right hand corner? “He did confirm that he had spent a few hours Friday, Dec. 28, at the police firing range with his 19-year-old daughter shooting guns, among which was his service revolver, a Glock .45-caliber pistol. Middletown is just up the road from me. You in the Tri-state area? I’m a journalist. I know that’s a Beretta, looks like an 83. Ah wait, no, it’s probably meant to be a 92. My bad. Hmmm. Slide safety, curved trigger guard, and old school strait dustcover; looks like a 92SB. I bet they just did a google search for ‘gun’ and grabbed whatever pic they liked best. hahahaha.. TROLOLOLOLOL !! problem Glock users? What is worse, the fact that someone used that image on a Glock shirt while they were designing it or that someone bought it not knowing? Meh, its just like Kleenex, THATONEGUY. How many times have you reached for a generic tissue and called it a Kleenex? Does that make you a “Kleenex Fan boy wannabe poser loser”? No, its just that Glock’s and Kleenex’s are ubiquitous and ingrained in our society’s consciousness. Why is this? Probably because they both work so well for their specific purpose of use. Yeah, except that analogy falls apart real fast, when generic tissues look the same as Kleenexes, and a Glock looks nothing like a Beretta. Sir, not all tissues are the same. As a member of the Tissue Lovers Club of America, I take issue with your statement. Which is exactly my point: they LOOK the same, but aren’t the same. If this shirt used pictures of a S&W Sigma or something, someone could make the argument that they look similar but are totally different. Saying it’s just a term synonymous with pistols in general is like saying Every pickup is a Ford, or every rifle an AK, or every sub-gun an Uzi. Or every generic rawket-lawnchair an RPG (AT-4, M79, M203, M2 Carl Gustav, you name it lol). Besides, what happens when specifics must be known, and all you can conjour up is “Hurr he had a glock i unno lol”. It could screw you out of everything from finding the guy who killed someone to losing a chance to win some money on a trivia questionnaire of some sort. Its more like saying “Check out my Corvette” and showing a picture of your Ferrari. If the shirt had said “This is my GUN…” that would have been fine, but when you name a specific make or model by brand name you expect that particular brand to be shown. Just like a Corvette isnt a Ferrari, a Glock isnt a Beretta. Where’s the shoulder thingie that goes up? Is that an “automatic pistol”? And ZedHead … naw, i don’t buy the comparison to Kleenex. Stoopidity ‘splains it so much betterer. No, it’s 50. caliber heat seeking bullets, it shoots down planes. Is that a photo of a Beretta or a Taurus? Pretty sure it has to be Beretta. I don’t believe Taurus has ever put the safety on the slide like a Beretta. And I would assume that on the Taurus it’s just a safety, not a combination safety/decocker like on the Beretta. Half correct. Taurus never put the safety on the slide. But the frame mounted ones did add the decocker function after they were first introduced. Cool; didn’t know that. I’ve never used one. It reminded me so much of the safety on a 1911 I figured it probably worked in a similar manner. It’s a very nice setup. Acts like a 1911, up safe down fire, but press even further down and it decocks. Big improvement over the berretta design. I hate slide safety’s. That does sound better than the setup on the Beretta. I wouldn’t care much about the safety though; I’d be fine with just the decocker, Sig style. I’d have to agree. I always carried it decocked anyway. Gun wasnt perfect though. Too thick a grip. And I wished the slide had been narrower, just would have looked better. The original Beretta 92 had a frame safety, it’s wasent until the 92SB that it got put on the frame (that’s also when they moved the magazine release to the grip instead of doing it the European way). Also, the Beretta has a decocker to, it acts like most Walther pistol, when put in safe, it drops the hammer into DA. Not only did some idiot not know the difference between a glock and a beretta, but he doesn’t know how to count either. 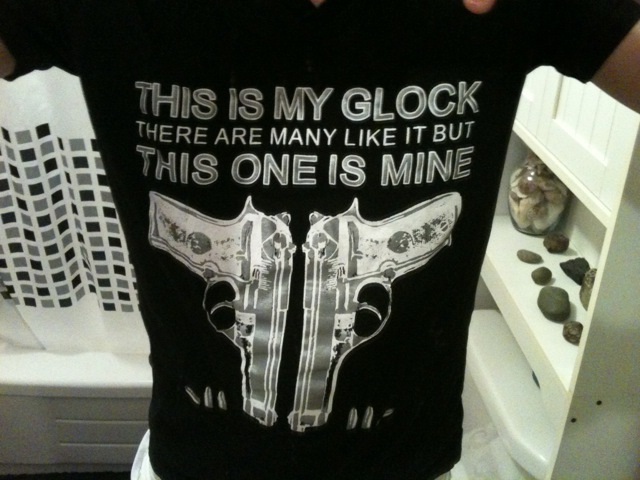 The shirt says “This one is mine” when there are two guns. There’s just one gun there. It’s image and mirror image. This guy probably also has Tap Out stickers all over is mini van and listens to the spice girls. They ought to make a shirt like this with the printing on the inside and printed with foil. That would be fun to take thru the full body scanners!! !